The Definitive Guide for Every Landlord Whether you just have an extra room to rent or a growing rental empire, you still need reliable information and expert advice to make sure you do it right. 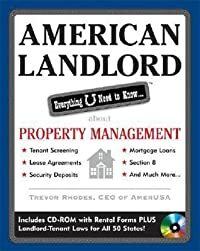 Drawn from years of experience helping thousands of landlords, American Landlord leads everyone from the new landlord to the old pro through all the ins and outs of property management. Inside: Buying and maintaining rental properties Successfully advertising your vacancies Safely and securely screening your applicants Effectively dealing with troublesome tenants Understanding rental forms and agreements BONUS CD-ROM FEATURES: Ready-to-print rental applications, lease agreements, checklists plus landlord-tenant laws for all 50 states, and much more!